1. What is CFA Institute Research Challenge Competition? Students work to research and analyze a publically traded company. Each university team should come up with a financial report with a recommendation to buy, sell or hold their assigned subject company. The CFA Institute Research Challenge provides students with a unique chance to learn from leading industry experts and compete with peers from the world's top finance programs. This annual educational initiative promotes best practices in equity research among the next generation of analysts through hands-on mentoring and intensive training in company analysis and presentation skills. 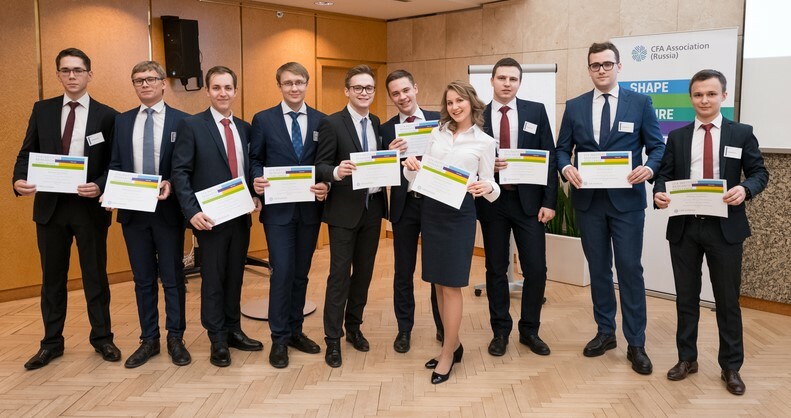 A faculty advisor puts together a team of students and registers them with CFA Association Russia and CFA Institute. Each team selects (or assigned by CFA Russia) an industry mentor who helps students during the competition. The main objective of the competition is to write and submit a financial report on a selected subject company. Reports are then submitted to CFA Association Russia and graded by local finance industry professionals. The top six teams with highest scores advance to the final part of the local competition. During the final, a selected panel of industry professionals evaluate the teams based on a 10-minute oral presentation and 10-minute Q&A session. The winning team of the local competition advances to the CFA Institute Research Challenge EMEA regional competition held in Switzerland. The winner from each regional competition will advance to the CFA Institute Research Challenge global competition in New York. Each teams consist of 3-5 members, who may be both undergraduate and/or graduate students. Each team must also have one faculty advisor and one industry mentor. A university campus may register a maximum of two teams. Team members may not have previously or currently been employed in a role whose primary duty involves fundamental company analysis; with the exception of students who qualify as an intern. CFA charterholders are not eligible to participate as team members. Please view the full version of the CFA Institute Research Challenge Rules. For students: develop your CV through hands-on mentoring and intensive training in company analysis and presentation skills. For universities: showcase your university on a global scale and provide your students with practical training and invaluable exposure to top industry professionals. For industry mentors and graders: encourage best practices in research among the next generation of investment professionalsm add value and give back to the investment profession in a high-impact manner. Watch below what Vladimir Tutkevich, CEO of CFA Russia, thinks about the Research Challenge and its benefits for universities and students. Learn how to participate in the 2018 - 2019 Research Challenge as a student, faculty advisor, or industry mentor, starting at the local level. See the 2018 - 2019 Competition Schedule.